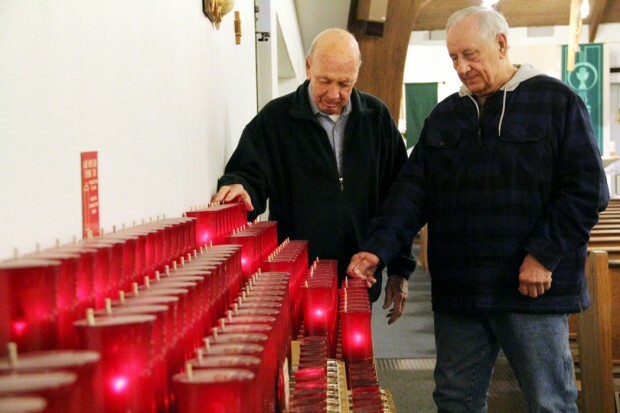 Joe Strybuc (right) and his friend Bill Daley light votive candles at St. Christopher Church, Philadelphia, where they work together as sacristans for daily Mass. Lighting candles for deceased loved ones is a wonderful Catholic tradition. Bill Daley, 87, and Joe Strybuc, 80, both widowers in St. Christopher Parish in Far Northeast Philadelphia, do that every weekday morning. Outwardly it is for other members of the parish, because they are the volunteer weekday sextons and lighting the altar candles is part of the routine, but their own loved ones are a constant memory. Losing the wife you love so very much is never easy. Prayer, parish and volunteerism have been their best therapy during recovery from the tragedies in their lives. For Bill, a retired highway police officer and originally from Cathedral parish, it was rough when Agnes died. She’d been battling leukemia for nine years, a fairly long time for that illness. He knew it was coming, but it was still very difficult when it happened on July 9, 1991; a date he tries not to remember. They had two girls, Deborah and Patty. Patty is married and lives in South Carolina; Deborah remained single and was close to home. Then Deborah was diagnosed with ovarian cancer. When she died on Dec. 1, 1998, it was positively devastating for Bill. He loved both his wife and daughter dearly. “They were sweethearts,” he said. Children are supposed to bury their parents; it should never be the other way around. For that matter, Bill’s career in police work involved rough and dangerous detail. He’d always assumed he would be the first in the family to go. Faith and volunteering are the two things that got Bill through especially after Deborah’s death. 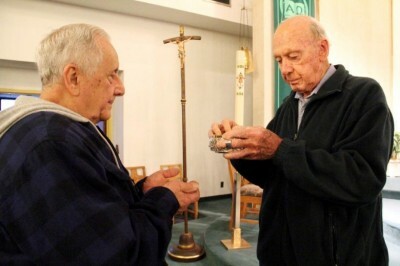 Bill Daley gives holy Communion to his friend Joe Strybuc. First there was volunteering at Immaculate Mary Nursing Home, where he goes three days a week, helping the residents with little things taking them to social events, wheeling them to the chapel or whatever is needed. He does this in spite of the fact he is now being treated for leukemia himself. One day, on the way home from the nursing home, there was a breakthrough. Bill thought how fortunate he was to be able to help others, including his wife and daughter in their illnesses. Another more tangible help came shortly after Deborah’s death when Father Chris Lucas, who was then in residence at St. Christopher Parish, at the request of the pastor, Msgr. 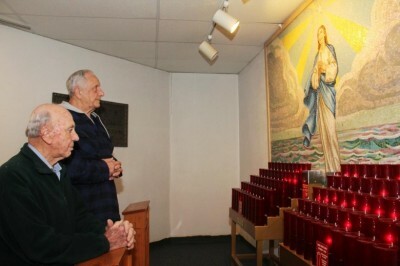 Joseph Garvin, suggested Bill and Joe Strybuc, who was also a recent widower, volunteer to be weekday sacristans, opening up the church and preparing it for the morning Masses. They have been doing it ever since. Joe is a Korean War veteran. He married Dorothy Cegelski and they raised two children, Debbie and John. They were both originally members of Polish parishes in Northeast Philadelphia; Joe was from St. Adalbert and Dorothy from St. John Cantius. His daughter told him, “Dad, you just can’t stop doing things,” and at her urging he joined St. Christopher’s 50 Plus Club, which was really a big help. The two friends pray at a side chapel at St. Christopher Church in Northeast Philadelphia. Faith had always been a big part of his life, even back in Korea where Mass was at times celebrated on the hood of a jeep. Now 6:30 a.m. Mass and rosary became part of his daily routine. “Now I get up earlier than I had to when I was working,” said Joe, a retired machinist. Although Joe was a daily Mass participant even before Dorothy died, as often is the case he knew Bill only as another member of the small early morning congregation. He’s also become closer to the other worshippers at the crack of dawn Mass. “There are at least 15 who come on a daily basis and they are all my friends, they would do anything for me,” he said. You could say it was the inspiration of the Holy Spirit that led Msgr. Garvin to suggest Bill and Joe for the early morning duties. The previous sexton had been given other duties, and he knew Bill and Joe were in the pews every day like clockwork.